Authors: Vissarionov S.V., Husainov N.O., Kokushin D.N. Aim. Treatment of patients with multiple congenital anomalies of the spine is a complex problem, demanding both correction and stabilization to be performed as early as possible without disturbing the growth of the spinal column. To achieve the latter, different instrumentation, such as rib-based distractors, may be useful. Little is known this treatment of congenital spine deformities. We aimed to investigate the results of treatment in our patients with the use of out-of-spine-based metal implants. Material and methods. During 2012–2016, there were 44 procedures performed in 20 patients at an age of 2 years to 12 years. In 13 cases, the deformity was located in the thoracic spine and in the thoracolumbar regions in 7 cases. We used bifocal rib-rib connections in 18 procedures, and a rib-spine connection in 26 cases. Results were evaluated based upon the amount of achieved correction after each procedure, amount of stages of treatment, and complication rates. Results. The mean curve magnitude was 68.7°. The mount of staged procedures varied from 3 to 7. The mean amount of achieved correction was 15.1°. In all cases, deformity was lower than at the beginning of the treatment. The complication rate was 15.9%. Conclusion. We assume that out-of-spine-based metal implants may be used in treatment of patients with multiple congenital spine and thorax anomalies, as this technique allows effective correction and stabilization of the deformity, as well as increases the volume of the hemithorax. congenital scoliosis, surgical treatment, rib synostosis, children. Despite the relatively low incidence of orthopedic pathology in children, congenital deformities of the spine represent a serious problem in the vertebrologist’s practice. The most severe in this category are congenital deformities with multiple abnormalities of development of vertebral bodies and rib synostosis. This is due to the nature of the curvature of the spinal column in such deformities and abnormalities of rib development during childhood. Such congenital spinal abnormalities are characterized by their severity and rigidity, steady and rapid progression, formation of compensatory arcs of curvature, associated with a significant decrease in quality of life and life expectancy [1-6]. There is a high mortality in this group of patients from rare cardiopulmonary diseases , with the development of restrictive lung disease and subsequently, pulmonary hypertension (cor pulmonale). This condition was first described by Campbell as “thoracic insufficiency syndrome” . It is generally recognized that conservative treatment with brace-therapy, physiotherapy or gradual plaster correction is unsuccessful [9, 10]. In the vast majority of cases, such patients require surgical treatment, aimed at restoring or improving trunk balance, preventing development of the thoracic insufficiency syndrome and neurological disorders, along with maintaining the length of the spinal column. The approach to management and surgical treatment of infants with isolated congenital thoracic and lumbar spine deformities are well described [1, 11]. These include stabilization of the deformity in situ, as well as definitive repair by extirpation/ partial resection of abnormally developed bone structures followed by stabilization with metal implants mounted on the spine [11-14]. However, treatment of patients with multiple vertebral developmental abnormalities and rib synostosis with these techniques are not always acceptable due to the risk of developing secondary deformities and reducing chest size, associated with the syndrome of thoracic failure [15, 16]. In addition, in this category of patients with a radical congenital curvature, surgical intervention at an early age does not enable single step correction; the necessity for multiple, staged surgical interventions during child growth risks the development of neurological disorders and complications of internal organs [17-19]. Recently, in patients with infantile forms of scoliosis, step-wise interventions with the use of “growing” metal implants have become widespread. In particular, extravertebral systems are being used, which enable mediated correction and stabilization of the spinal deformity until the child reaches the age when final surgical intervention is possible. We apply these metal implants extravertebrally; rib-rib, rib-pelvic or rib-vertebral fixation and are not accompanied by extensive stabilization of the spine (more than one vertebral-motor segment) and bone grafting. The main indication for their use is the presence of a congenital abnormality of the thorax (rib synostosis). The first and one of the most widely used devices is VEPTR (Vertical Expandable Prosthetic Titanium Rib), introduced by Robert Campbell and Melvin Smith in 1989 to treat a patient with a thoracic failure syndrome . There are reports of the successful use of these devices in various types of application (rib-rib connection, rib-vertebral, with pelvic bone support) in patients with neurogenic forms of scoliosis . However, it should be emphasized that there is limited experience with their use in patients with congenital deformities of the spine with multiple vertebral defects and rib synostosis. The aim of the present study is to analyze the use of rib-rib and rib-vertebral metal implants in the surgical treatment of pediatric patients with congenital deformity of the thoracic and lumbar spine with multiple abnormalities of development of vertebrae and rib synostosis. 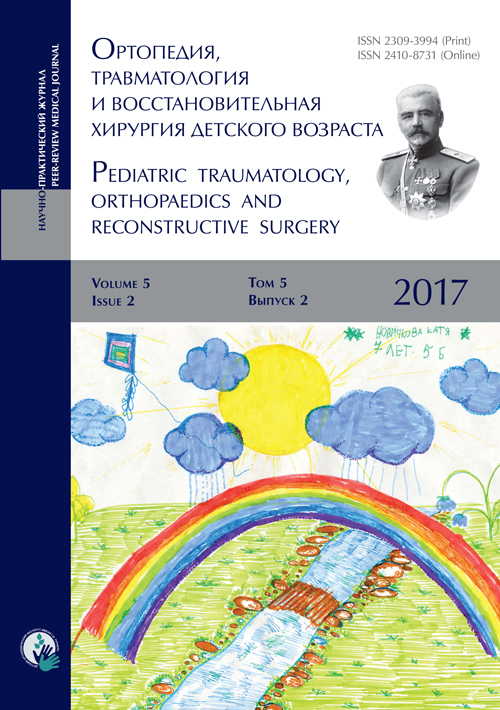 Between 2012 and 2016, 44 procedures were performed in twenty children aged 2–12 years at the Department of Pathology of The Spine and Neurosurgery of The Turner Scientific and Research Institute for Children’s Orthopedics of the Russian Ministry of Health. The average age of patients at the time of intervention was 6.9 years. All the patients (or their representatives) voluntarily signed informed consent to undergo surgical intervention and participate in the study. In all patients, the scoliotic deformity was caused by multiple combined abnormalities of vertebral development (asymmetric butterfly-shaped vertebrae, lateral non-segmented rod, multiple semi-segmented posterolateral halfvertebrae) and unilateral rib synostosis. The study group did not include patients with concomitant pathology of the spinal cord and the spinal canal (spina bifida, different variants of fixation of the spinal cord), as well as patients who underwent deformity correction at the time of introduction of the surgical technique. No neurological disorders were observed in any child. In 13 cases, the deformity was thoracic; it wasм the thoracolumbar in the remaining seven (Fig. 1). Eighteen surgical interventions were performed using metal implants with bifocal rib-rib connection and 26 interventions with rib-vertebral systems, involving step-wise interventions. Some of them were accompanied by a replacement of the corrective implant (Fig. 2). Indications for the surgical intervention included severe congenital deformity of the spine with multiple developmental abnormalities of the vertebrae and unilateral rib synostosis, rapid progression of the existing curvature (more than 10° per year) and sharply reduced volume of hemithorax on the side of the rib block. The degree of scoliotic deformity was determined by the Cobb method on X-rays of the spine in a frontal projection, in the prone position. Computerized tomography was performed to confirm the nature of the defect, determine the volume of hemithorax on the concave side of the deformity and to evaluate the anatomical and anthropometric parameters of the vertebrae and the nature of the curvature of the rib cage. To exclude intra-channel pathology, magnetic resonance imaging was performed. In patients with congenital deformity of the spine in the thoracic region with multiple abnormalities of development of vertebral bodies and unilateral rib synostosis, surgical intervention was performed using a ribrib metal implant. The aim of the surgery was to restore the shape of the chest along with mediated correction and stabilization of congenital curvature of the spine. This was carried out with a metal implant with the formation of rib-rib connection on the upper and lower boundaries of synostosed ribs along the scoliotic arch of the deformity (Fig. 3). Fig. 3. X-rays of the patient S., 5 years old. Diagnosis of congenital scoliosis with multiple spinal abnormalities (posterolateral Th2(S), Th6(S) semi-vertebrae, right-sided non-segmented rod Th4-Th7, synostosis of the ribs 2–7 on the right): a — before the surgery; b – after the surgery. In patients with congenital curvature of the thoracic and lumbar spine with rib synostosis, a rib-vertebral metal implant was used. Following this, the upper rib connection was formed at the level of the upper part of the synostosed ribs, and the lower support elements (transpedicular screws) were inserted in the lumbar spine along the concave side of the deformity (Fig. 4). The support platforms made were connected by means of two rods. All patients underwent several (2-3) longitudinal osteotomies of the ribs along the blocked ribs, and a distracting action was performed along the rods. The step-wise correction of the spinal deformity was made by separating the sliding part of the metal implant and subsequent distraction once every 6–9 months. The results of surgery were assessed by the degree of correction of the scoliotic arch immediately after the surgery. The number of stages of surgical treatment, and the frequency and nature of complications were evaluated. The mean level of scoliotic deformity before surgery was 68.7° (36 to 94°) assessed by the Cobb method. The number of interventions varied from 3 to 7. Mean deformity correction after surgery at the end of the follow-up period (from 1 year to 4 years) was 15.1°. The mean correction at each stage of intervention was 11.4°. On detailed analysis of each stage, it was found that the first surgical intervention had the most corrective effect. Later, a slow but stable decrease in the degree of the correction was noted (Fig. 5). The mean correction with rib-rib metal implants was 8.6°; with rib-vertebral metal implants it was 18.6°. On long term follow up (from 1 to 4 years) after step-wise surgeries, the degree of deformity did not exceed the initial value in any patient. This suggested absence of progression of the congenital curvature. In the postoperative period, on multislice computed tomography, a nearly 2-fold increase in the volume of hemithorax and lung on the side of the intervention was seen (Fig. 6). The incidence of complications in the postoperative period was 15.9%. In four cases, destabilization of the metal implants was noted (fracture of the rod); in three cases, trophic changes in soft tissue around the surgical site on the side of the installed metal implants was noted. The first group of complications was explained by significant degree of the scoliotic arch of the spinal deformity and the progressive nature of the curvature along with the continued growth of the child; the second group of complications was due to patient’s hypotrophy, as well as the absence of a pronounced muscular and subcutaneous fat layer on the concave side of the thorax, which created technical difficulties in covering the metal implant. The destabilization of the metal implant required repeated interventions to replace the rods. The second group, characterized by delayed wound healing, was successfully managed with conservative measures. The course of congenital scoliotic deformities, with combined abnormalities of development of spine and unilateral rib synostosis, is characterized by an early onset, rapid and steady progression as the child grows and develops. The difficulty in treating such patients is the lack of a single stage procedure for definitive repair of the congenital deformity and stabilization of the spine in a physiologically correct position. The inability to achieve this result is due to multiple abnormalities of the vertebrae and rib synostosis and a high risk of developing secondary deformities of the spinal column, during rapid growth and development of the child. One of the treatment options of this category of patients is the use of metal implants that enable to reduce or stabilize the congenital deformity by altering the rib cage, avoiding direct interventions on the spine. This therapeutic approach helps prevention of rapid progression of the congenital curvature of the spine till bone growth ceases. At this stage, it is possible to perform the final stabilizing surgical intervention, and increase the volume of the thorax to help lung development. Our results show the possibility of correction of the congenital deformity, increasing the length of the spine on the side of deformity by an average of 8.0 mm/year and improving lung function. Radioisotope scanning has demonstrated improved pulmonary perfusion and computed tomography has demonstrated increased volume of lung tissue in previous studies. [22-26]. We observed an increase in volume of lung tissue on multi-slice computer tomography. However, there are reports of a negative impact of this method on lung function due to the presence of a metal implant and postoperative scars limiting rib excursion . In this situation, choosing the ideal age for intervention is important, because in patients who underwent an increase in hemithorax volume over the age of 6 years, an emphysematous expansion of lung tissue was observed, without significant improvement in the lung function, as opposed to younger patients . This is explained by the findings of Dimeglio et al., which reveal that the alveolar development occurs most actively during the first 5 years of a child’s life; after 7–8 years their numbers do not change [28, 29]. Hence, only surgical interventions performed at an early age will improve lung function. The disadvantage of this type of intervention is a high incidence of complications (according to some authors, up to 72%), mainly associated with impaired surgical wound healing, infective complications, pleural injuries, migration of support elements and damage to the brachial plexus [30, 31]. In our study, the incidence of complications was 15.9%, limited to fracture of the metal implant rod and delayed surgical wound healing. In order to prevent complications, we consider it important to carefully mobilize the periosteum of the ribs and the parietal pleura intimately. This technique prevents damage to the pleura during correction with requirement for drainage of the pleural cavity. At the same time, it should be noted that during step-wise surgical interventions, regardless of timing, we were faced with spontaneous formation of a significant bone block between the ribs in the zone of the primary surgery. We had to perform repeated osteotomies to enable step-wise correction. It is worth noting that, despite the fact that the surgery did not include vertebrotomy, we noted a decrease in the degree of deformity to the correction that occurs at the level of the spinal-motor segments adjacent to the anomaly. This also correlates with the fact that when using the rib-vertebral locks, the degree of correction was greater. The rate and frequency of stage distractions is not established–similarly with the use of “growing rods,” they are performed on average 6–9 months before reaching the bone maturity, which is sufficient for completing the final surgical intervention. In our patients, we were guided by the rate of growth of the child and the degree of progression of the deformity; in many patients it was different due to the variable type of defects. Several authors have noted the regularity which was confirmed in our study, characterized by gradual decrease in the degree of correction during step-wise surgical interventions . The latter fact may indirectly indicate that, despite the intervention, unilateral stabilization with metal implant, without direct skeletization of the vertebrae directly, leads to a gradual reduction of the degree of correction of the congenital deformity. From our point of view, this corrective system has limited indications. The technique can be used in children with congenital deformity of the spine, caused by multiple abnormalities in the development of the vertebrae and/or ribs, if it is impossible to perform a one-stage or a series of surgical interventions that enable to completely correct the congenital curvature of the spine. Our study demonstrates that the use of ribrib and rib-vertebral systems in the treatment of congenital scoliotic deformities with combined vertebral developmental abnormalities and unilateral rib synostosis enables effective correction of the existing deformity (on average by 15.1°); Besides, it prevents rapid progression as the child grows, and increases the volume of hemithorax. However, a significant number of complications may be associated with this technique. Hence, wide application of this technique may not be feasible and a search for more effective techniques of correction of congenital deformity in children with multiple abnormalities of vertebral development and rib synostosis is warranted. The authors of the article declare no conflict of interest. Berend N, Marlin GE. Arrest of alveolar multiplication in kyphoscoliosis. Pathology. 1979;11:485-491. doi: 10.3109/00313027909059026. Bergofsky EH. Respiratory failure in disorders of the thoracic cage. Am Rev Respir Dis. 1979;119:643-669. Campbell RM Jr, et al. The characteristics of thoracic insufficiency syndrome associated with fused ribs and congenital scoliosis. J Bone Joint Surg Am. 2003;85-A(3):399-408. doi: 10.2106/00004623-200303000-00001. Goldberg CJ, Moore DP, Fogarty EE, et al. The natural history of early onset scoliosis. Stud Health Technol Inform. 2002;91:68-70. Campbell RM Jr, Hell-Vocke AK. Growth of the thoracic spine in congenital scoliosis after expansion thoracoplasty. J Bone Joint Surg Am. 2003;85-A(3):409-420. doi: 10.2106/00004623-200303000-00002. Swank SM, Winter RB, Moe JH. Scoliosis and cor pulmonale. Spine. 1982;7:343-54. doi: 10.1097/00007632-198207000-00004. Campbell Jr RM, Smith MD. Thoracic insufficiency syndrome and exotic scoliosis. J Bone Joint Surg Am. 2007;89(Suppl 1):108-22. doi: 10.2106/00004623-200701001-00013. Winter RB, Lonstein JE, Boachie-Adjei O. Congenital spinal deformity. Instr Course Lect. 1996;45:117-27. Bouchoucha S, Khelifi A, Saied W, et al. Progressive correction of severe spinal deformities with halo-gravity traction. Acta Orthop Belg. 2011; 77:529-534. Hedequist DJ, Hall JE, Emans JB. Hemivertebra excision in children via simultaneous anterior and posterior exposures. J Pediatr Orthop. 2005;25:60-63. doi: 10.1097/01241398-200501000-00014. Виссарионов С.В., Кокушин Д.Н., Картавенко К.А., Ефремов А.М. Хирургическое лечение детей с врожденной деформацией поясничного и пояснично-крестцового отделов позвоночника // Хирургия позвоночника. – 2012. – № 3. – С. 33–37. [Vissarionov SV, Kartavenko KA, Kokushin DN, Efremov AM. Surgical treatment of children with congenital lumbar and lumbo-sacral spine deformity. Spine Surgery. 2012;(3):33-37. (In Russ.)]. doi: 10.14531/ss2012.3.33-37. Виссарионов С.В., Кокушин Д.Н., Белянчиков С.М., Ефремов А.М. Хирургическое лечение детей с врожденной деформацией верхнегрудного отдела позвоночника // Хирургия позвоночника. – 2011. – № 2. – С. 035-040. [Vissarionov SV, Kokushin DN, Belyanchikov SM, Efremov AM. Surgical treatment of children with congenital deformity of the upper thoracic spine. Spine Surgery. 2011;(2):35-40. (In Russ.)]. doi: 10.14531/ss2011.2.35-40. Karol LA, Johnston C, Mladenov K, et al. Pulmonary function following early thoracic fusion in non-neuromuscular scoliosis. J Bone Joint Surg Am. 2008;90:1272-1281. doi: 10.2106/jbjs.g.00184. Terek RM, Wehner J, Lubicky JP. Crankshaft phenomenon in congenital scoliosis: a preliminary report. J Pediatr Orthop. 1991;11(4):527-532. doi: 10.1097/01241398-199107000-00021. Михайловский М.В., Ханаев А.Л. Врожденные аномалии вне апикальной зоны: диагноз и принципы лечения // Хирургия позвоночника. – 2009. – № 3. – C. 46–50. [Mikhailovsky MV, Khanaev AL. Congenital abnormalities outside the apical region: diagnosis and treatment approaches. Spine Sergery. 2009;(3):46-50. (In Russ.)]. doi: 10.14531/ss2009.3.46-50. Shah SA, Sucato DJ, Newton, PO, et al. Perioperative neurologic events from a multicenter consecutive series of pediatric vertebral column resection: nature, frequency and outcomes. Proceedings of the 17th International Meeting on Advanced Spine Techniques. Toronto, Ontario, Canada; 2010:97. Lenke LG, Newton PO, Sucato DJ, et al. Complications following 147 consecutive vertebral column resections for severe pediatric spinal deformity: a multicenter analysis. Spine. 2013;38(2):119-132. doi: 10.1097/brs.0b013e318269fab1. Campbell RM Jr, Smith MD, Hell-Vocke AK. Expansion thoracoplasty: the surgical technique of opening-wedge thoracostomy. Surgical technique. J Bone Joint Surg Am. 2004; 86-A Suppl 1:51-64. doi: 10.2106/00004623-200403001-00008. El-Hawary, Kadhim M, Smith J, et al. VEPTR Implantation to Treat Children With Early-Onset Scoliosis Without Rib Abnormalities: Early Results From a Prospective Multicenter Study. J Pediatr Orthop. 2017 Jan 30. doi: 10.1097/BPO.0000000000000943. Михайловский М.В., Ульрих Э.В., Суздалов В.А., и др. Инструментарий VEPTR в хирургии инфантильных и ювенильных сколиозов: первый отечественный опыт // Хирургия позвоночника. – 2010. – № 3. – C. 31–41. [Mikhailovsky MV, Ulrikh EV, Suzdalov VA, et al. VEPTR instrumentation in the surgery for infantile and juvenile scoliosis: first experience in Russia. Spine Surgery. 2010;(3):31-41. (In Russ.)]. doi: 10.14531/ss2010.3.31-41. Рябых С.О. Хирургическое лечение деформаций позвоночника высокого риска: автореф. дис. … д-ра мед. наук. – Курган, 2014. [Ryabykh SO. Surgical treatment of high-risk spine deformities. [dissertation] Kurgan; 2014. (In Russ.)]. Emans JB, Caubet JF, Ordonez CL, et al. The treatment of spine and chest wall deformities with fused ribs by expansion thoracostomy and insertion of vertical expandable prosthetic titanium rib: growth of thoracic spine and improvement of lung volumes. Spine. 2005;30 (Suppl. 17):S58-68; 86 (Suppl. 1):51-64. doi: 10.1097/01.brs.0000175194.31986.2f. Gadepalli SK, Hirschl RB, Tsai WC, et al. Vertical expandable prosthetic titanium rib device insertion: Does it improve lung function? J Pediatr Surg. 2011;46:77-80. doi: 10.1016/j.jpedsurg.2010.09.070. Johnston C, McClung A, Salah F. Computed Tomography Lung Volume Changes After Surgical Treatment for Early-Onset Scoliosis. Spine Deformity. 2014.2(6):460-466. doi: 10.1016/j.jspd.2014.04.005. Motoyama EK, Yang CI, Deeney VF. Thoracic malformation with early onset scoliosis: Effect of serial VEPTR expansion thoracoplasty on lung growth. Paediatr Respir Rev. 2009;10:12-7. doi: 10.1016/j.prrv.2008.10.004. Dimeglio A, Canavese F. The growing spine: how spinal deformities influence normal spine and thoracic cage growth. Eur Spine J. 2012;21:64-70. doi: 10.1007/s00586-011-1983-3. Redding G, Song K, Inscore S, et al. Lung function asymmetry in children with congenital and infantile scoliosis. Spine J. 2008;8(4):639-644. doi: 10.1016/j.spinee.2007.04.020. Garg S, LaGreca J, St. Hilaire T. Wound complications of vertical expandable prosthetic titanium rib incisions. Spine. 2014;39:E777-81. doi: 10.1097/brs.0000000000000343. Sankar WN, Acevedo DC, Skaggs DL. Comparison of complications among growing spinal implants. Spine. 2010;35:2091-6. doi: 10.1097/brs.0b013e3181c6edd7. Sankar WN, Skaggs DL, Yazici M, et al. Lengthening of dual growing rods and the law of diminishing returns. Spine. 2011;36:806-9. doi: 10.1097/brs.0b013e318214d78f. Copyright (c) 2017 Vissarionov S.V., Husainov N.O., Kokushin D.N.